Electric (110v) Cooling Fans are included in the kit for the 33′ and 42′ Growing Domes as standard greenhouse accessories. The 33′ Growing Dome comes with three 110V fans standard and the 42′ Growing Dome comes with four 110v fans standard. The 110v cooling fans are energy efficient and only use between 50-85 watts of energy each, which is the size of an average light bulb. They also are controlled by a thermostat, so only run when they are needed. 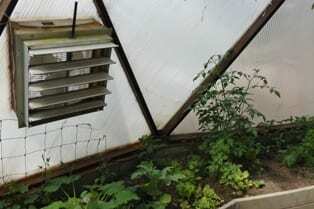 These large fans circulate the air thoroughly and augment the chimney effect to help push the hot air out of the top vents of the solar greenhouse. Electric fans are also helpful for climates where it can be hot but cloudy on a regular basis and/or where the greenhouse is shaded by a lot of trees because they run regardless of sun exposure. Depending on your needs and circumstances you may want to upgrade to our Solar Powered Cooling Option.